Every day from 10.00am to 02.00pm and from 05.00pm to 09.00pm. 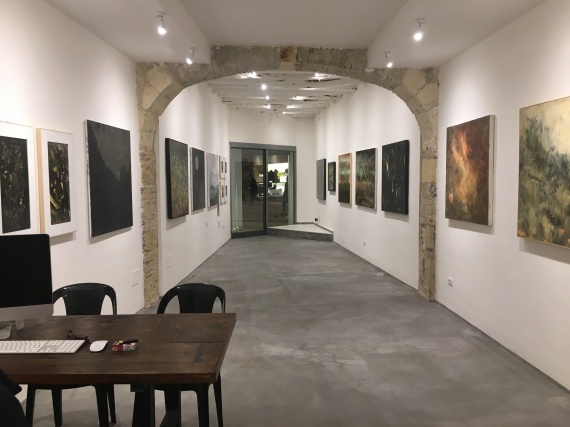 Art exhibition space with permanent exhibition of the painter Mariano Chelo and temporary exhibitions by other artists in the "Face to Face" exhibition that takes place from November to May. The study can also be visited. The MAP is an exhibition space with offices in Cagliari and Bosa. Besides hosting the studio of the painter Mariano Chelo, where he works daily, he offers visitors the opportunity to see exhibitions by other Sardinian and international artists. Born May 27, 1958 at dawn under the sky of Bosa, a small town on the river Temo in Sardinia. Love for art blossoms at an early age and already at fourteen his skills emerge successfully and with these also the sales of his first canvases. Thus begins a journey of passion that over time will become the exercise of his art. The Bosan painter uses colours and shapes to communicate what he sees and what he feels. With talent he transforms the emotional vortex of every man into a creative driving force. Thus, inspired by the joy of being able to express and block a personal story over time, it magnificently succeeds in wrapping the viewer through a re-elaborating and abstract process of reality. His works, imbued with an expressive force that time and space do not affect, tell an emotion capable of regenerating. After studying at the Artistic Lyceum of Cagliari and at the ISIA in Florence, a specialization path begins. In particular, the painter's gaze settles on the picaresque description of the human figure. Driven by a curious and lively spirit always intent on new forms of art, he expresses his soul through new scenarios and new challenges: from 1981 to 1990 he deals with advertising graphics and photography and also thanks to these new experiences he manages to give a new setting up his work, finding, in surrealism, in cubism and abstractionism, a language with which to address different, innovative and current issues. In 1991 a solo show in Bosa will kick off a long series of personal and collective exhibitions in Italy and abroad. In 2003 he founded the MAP "Peripheral Artistic Movements" with the headquarters in Corso Vittorio Emanuele in Bosa. In 2007 he opened a branch of the MAP in Cagliari. Mariano Chelo currently lives and works in Sardinia between Cagliari and Bosa in several artistic-cultural projects in which he inserts the technique of action painting and installations and performances. The MAP of Cagliari is located in via Garibaldi, a traditional pedestrian street for walking and shopping.